An old pattern from the Penobscot River region of Maine. Originally intended for trout and landlocked salmon, the fly was found to be good for smallmouth and largemouth bass as well. Perhaps steelhead would fall for this fly too? An Atlantic salmon fly pattern originated by the late Poul Jorgensen. During his time Poul was known among the best fly tyers in the world, largely because of his work with classic salmon flies. The Sir Conrad was tied for his friend Bill Conrad of television fame. An adaptation of the Cain River series of flies, by C. Jim Pray of Eureka, California. 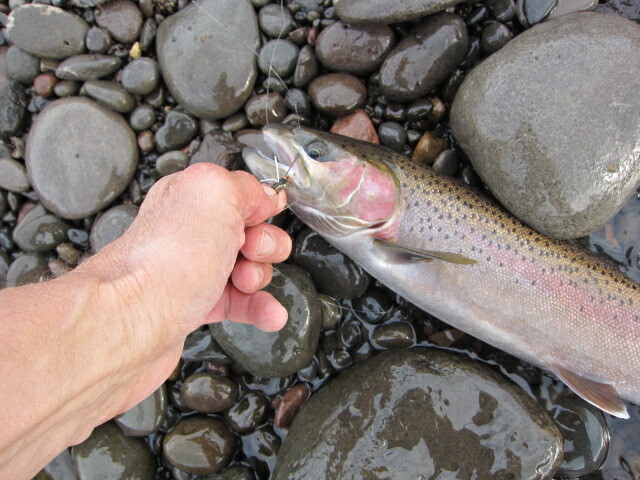 This steelhead version was especially successful on the Klamath River. Originally tied for Atlantic salmon, the Cain River series was also good for trout and bass. The Alaska Mary Ann fly pin is of a classic fly first tied in the 1920s by Frank Dufresne. The color scheme for the fly he derived from the red and white carved-ivory ice-fishing decoys that the native Eskimos made. 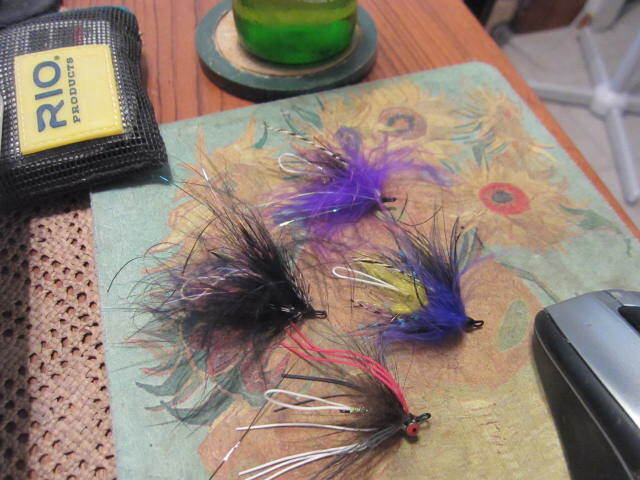 I’ve been tying old classic fly patterns on decorative hook pins for Christmas. Here are a few of my favorites. The hat pin hooks are not easy to tie on. There is the difficulty of tying around the pin and it’s keeper. Number one is avoid the sharp point of the pin. Ouch! Almost any fly pattern can be tied on fly pin. I’m looking forward to trying a few new patterns this year! Intruders! That’s what’s on the bench. Last week in Medford, Oregon. Considering all the snow, ice, rain and high water of early January this year it is good to reflect back on the warm days and hot fish of summer on the Rogue River, Oregon. Early morning wet wading. Oh what a treat. It will be a while until we can do this again. In the meantime keep an eye on the weather and river flow. Winter steelhead fishing is next on the Rogue agenda, and with the high water flows, fish could be trickling in sooner than expected. A diminutive Brown Fork Tail Prince Nymph working well. I like the pattern with a slight, yellow-brown tail. Today I was using the pattern on the size 10 hook.